(2:00) PUB / RESTAURANT SOUNDS: A typical English country pub serving roast dinner on a Sunday afternoon. Includes families eating, bar sounds, talking, plate and cutlery sounds, tills, bottles and glasses and a lively atmosphere. Recorded at the center of a large country pub with oak beams and a log fire. 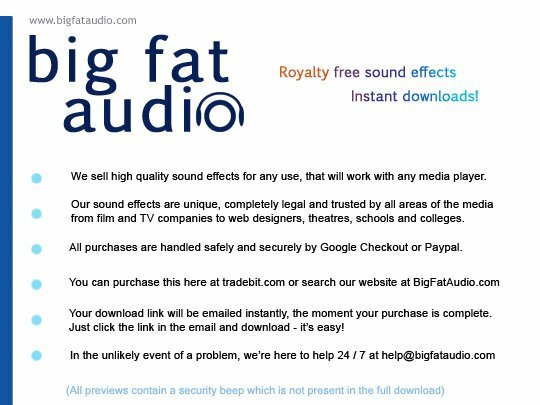 This high quality country pub sound effect is instantly delivered in CD quality WAV format via Paypal. A download link is automatically generated and sent to your registered Paypal email address when the transaction completes (preview contains a security watermark tone).